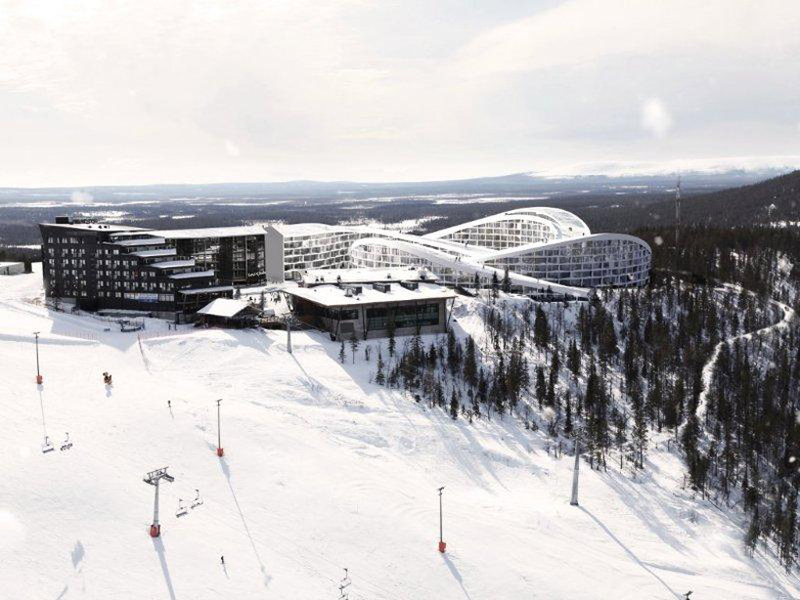 copenhagen-based practice BIG architects has won first prize in the invited design competition for a 47,000 m2 ski resort and recreational center in levi, finland. conceived as a gentle extension of the summit, the proposed project generates four artificial hills for skiers while housing various functions and accommodations within. the four series of buildings feature an arched form that skiers can descend from the resort’s rooftop in any direction. arranged to direct views towards the surrounding landscape and sirkka village at the foot of the mountain, the softly undulating volumes lend a visual continuity throughout the site. a network of paths which prioritizes skiers and pedestrians link the resort together, creating intimate spatial pockets and ‘internal streets’. all accommodation units including eight private villas and elevated private gardens provide sweeping views of the snowy landscape. ‘instead of creating design solutions that aim at dealing with snow by shoveling or moving it, we want to create a village that utilizes the full potential of snow. when it is caught on the facade, the window frames become a living part of the landscape, adapting to changes in the weather. the light granite facade enhances the intimate relation with the nature,’ says project leader hanna johansson. during the summer, the man-made slopes will serve as a green continuum of the natural landscape, catering to hikers and other visitors. Hopefully THIS ski resort project doesn’t get cancelled? ?? this must be built before Jackie Chan is too old to snowboard down it on something unlikely in a movie. So, apparently one can ski down the roofs, how does one get up on them, lifts, trudging?